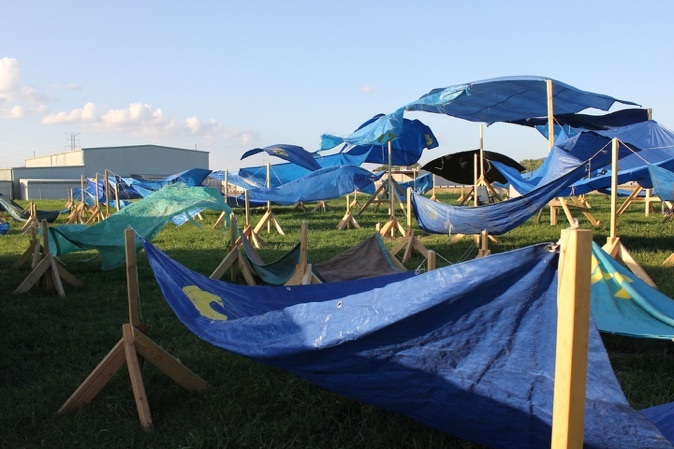 Created in collaboration with artist Heidi Bender tarp lake is an artificial lake landscape created from billowing, blue, and donated cast-off tarps. Supported in the wind on wooden scaffolding, the tarps playfully whip in the wind, mimicking waves, and are collectively massive enough to identify from the sky. Interviews from tarp donors are presented throughout the lake, giving the piece a poetic sensibility and inviting audiences to the underside where the tarps filter the sunlight, homogenizing the landscape with a blue tint, and provide shade from the sun. Hot air ballooners look twice at the installation and, for a moment, believe an actual lake has materialized. Aerial footage of the lake taken from suspended outdoor cameras, akin to a freshly shot Google Map, is accessible via cell phone. 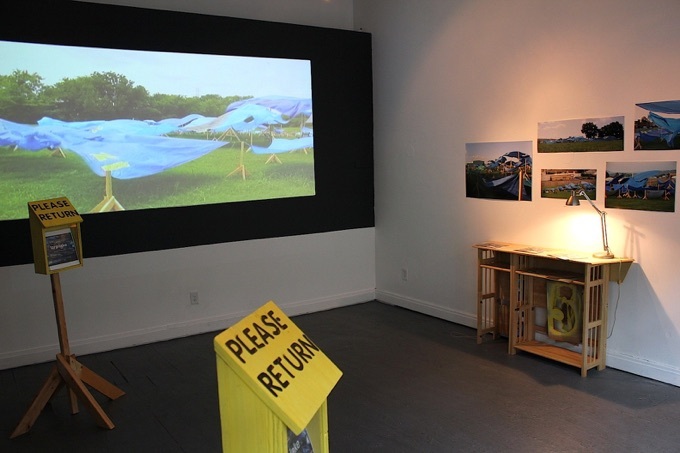 However, at odds with its playful spectacle, tarp lake not only masks natural ecologies in order to form a modern version of paradise, it also creates a simulation that fools our mapping technologies. The lake creates an ironic space for two reasons. 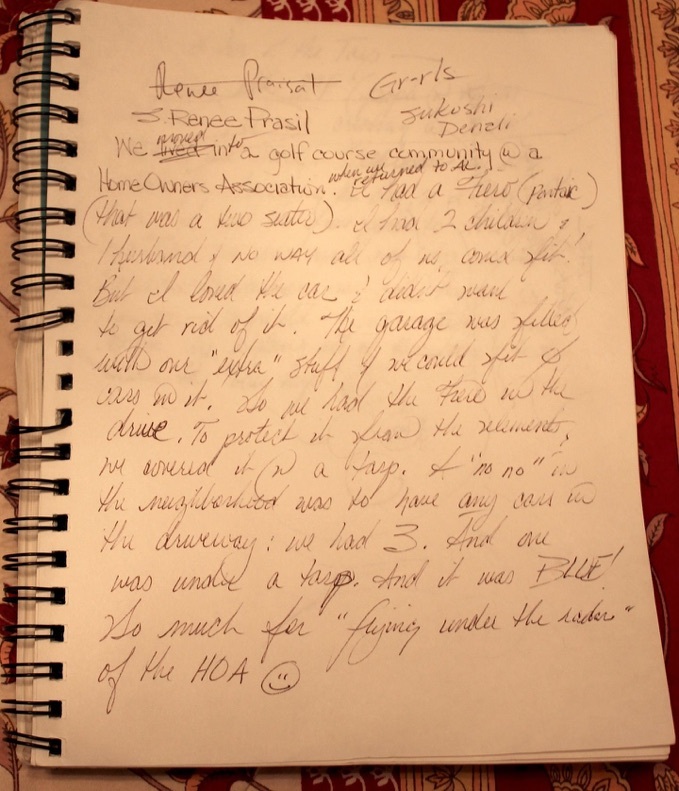 First, it is simultaneously artificial and authentic. 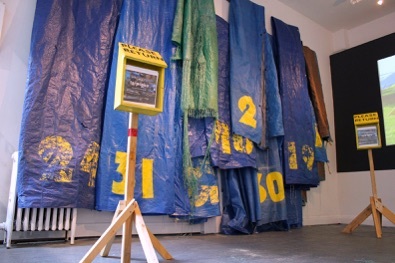 While it is made of unnatural plastic, audiences are able to explore in detail the intimate traces of the tarps’ previous lives, such as mud from a colonial archeological dig, grease stains from spent farm equipment, shredded areas from forceful winds, etc. The second and more profound irony is that these rugged discarded tarps, consolidated into a lake designed to protect the audience, are symbolic of any lake’s ephemeral feature. We received tarps that were used to shield or maintain things. When the tarps are cast-off, the objects they had safeguarded are exposed to the weather, grime, and abrasion of time. In a sense, the objects begin their journey to a modern day ruin, a place where nature resets itself over humanity’s concrete detritus. These cast-off tarps become synonymous with the point at which we begin to let things decay, when our desire is spent and we stop maintaining a small portion of the built landscape. Thus, the larger irony is that the lake providing protection is deeply symbolic of the impermanence of that very protection. While bathed in the tarps’ healing blue light, the lakebed seems to chime in that its life too is transient. 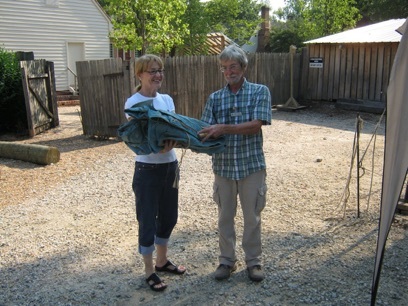 Archeologist Andrew Edwards of the Department of Architectural Research at the Colonial Williamsburg Foundation gave us this set of three small blue tarps used to protect two human interments found at the Public Armoury site in 2010. 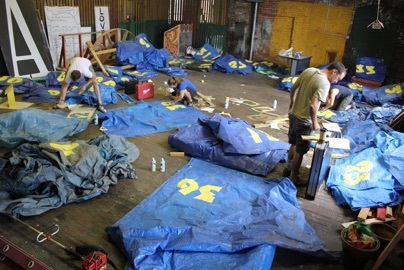 The tarps shielded the remains from the elements during excavation. Their burial pre-dated the 1778-1780 Armoury period. The archaeologists know nothing about their lives, but found it necessary to move their remains to a place where they would be safe from intrusion from the outside world (construction, grading work, archeology). 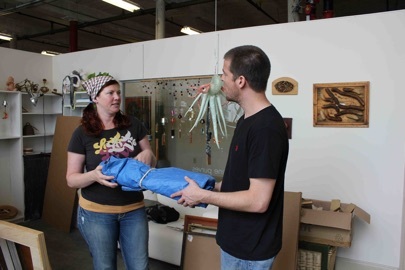 Katherine Purves owns and operates Calypso Swan, a stained glass and sculpture gallery at Lowe Mill Arts. Katherine lived in southwestern Utah for a year working with a wilderness therapy program in which she spent three- month periods of time in the wilderness with troubled teens. She used this tarp as her tent, ground fly, and said there is a special way to fold it into a backpack. We are very grateful for the friendship and support of the Lowe Mill Arts community, which has allowed this project to blossom in so many unforeseen ways. Beth Norwood, Lowe Mill burlesque performer and WLRH radio host, dedicated a set to tarp lake and played only lake-themed music. 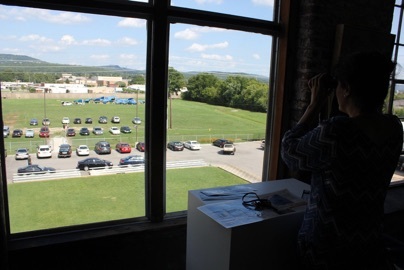 Director Marcia Freeland provided us with a 3rd floor gallery space where visitors could view lake activity through binoculars. Soliciting tarp donations at our booth at UAHuntsville’s Charged Up For Change! 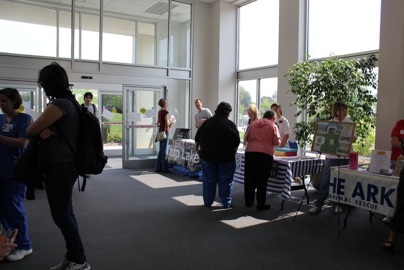 EXPO- an event encouraging visitors to create social change in unusual ways. 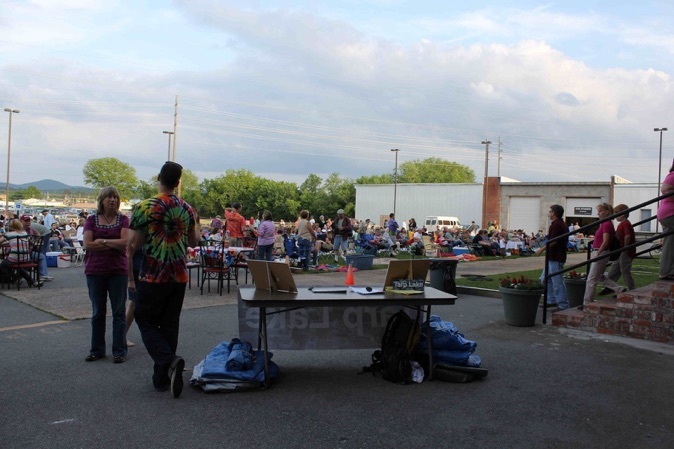 To generate project hype Lowe Mill also provided us with a booth at their Friday Night Summer Concert Series. 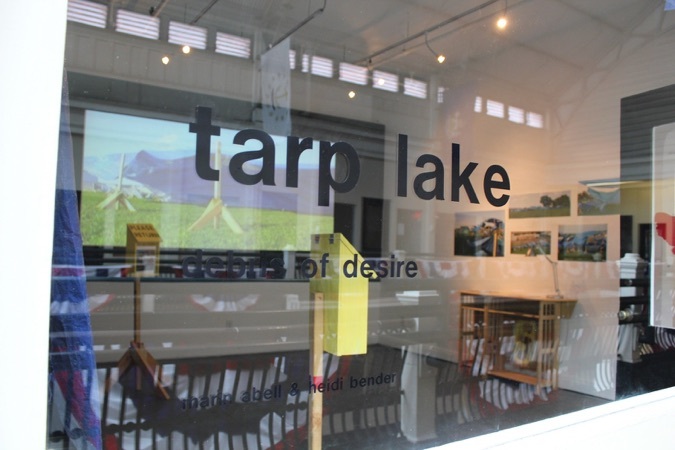 tarp lake has traveled to the Coop Gallery in Nashville, where visitors can research our collection. Click here to download a pdf. of our catalogue.